Fall is one of my favorite times of the year because it starts cooling off and you can go outside and enjoy the beautiful weather and autumn colors. 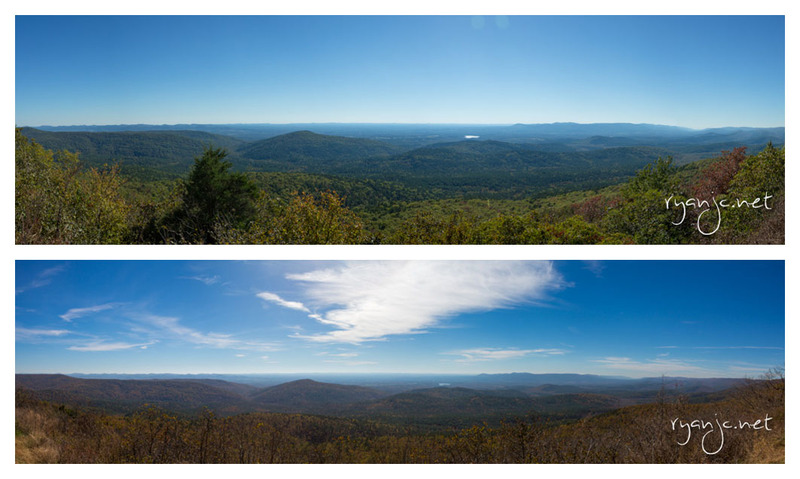 A couple weekends ago, I was in Little Rock and got a chance to do some sightseeing, road tripping, and a minimal amount of hiking around Hot Springs National Park and the other State and National preserves in the area. I was really excited because Arkansas is known for their fall foliage and even has a page to track week by week the color in the various parts of the state. They have regular updates with descriptions and photos of all the autumn hot spots. 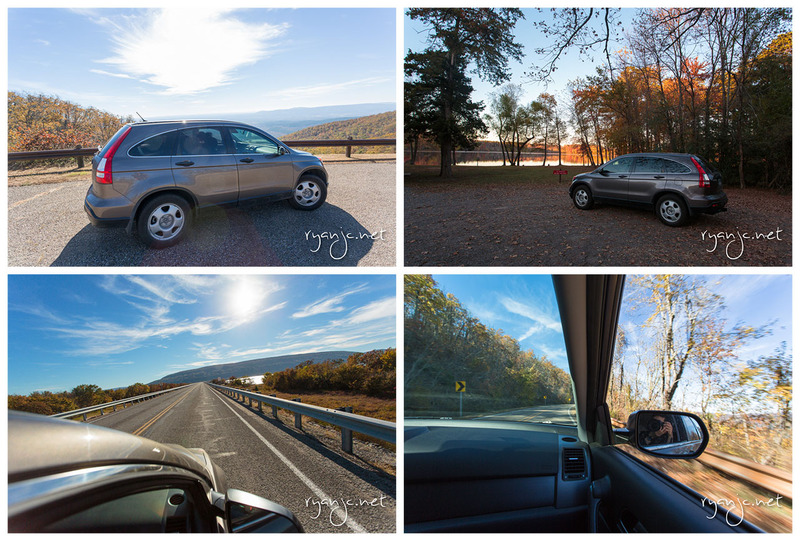 The first day we made the drive to Mount Magazine, the tallest mountain in Arkansas, stopping at Hot Springs and taking the scenic byway Highway 7 past Nimrod Lake to Mount Magazine State Park. Nothing like hitting the open road to see new places! Hot Springs National Park, Hot Springs, AR. The city and now park of Hot Springs, AR are home to a famous row of Bathhouses which used to be popular for medicinal cleansing and healing. Today, it’d be more akin to a spa. There are many little shops along the street and it’s also home to the Mountain Valley Spring Water company. I didn’t make the connection that the water in the hotel (green bottles) was actually nearby from Hot Springs! At the end of the street is actually a public fountain where you can fill up your water bottle and drink. I have to say that the hiking and size/scale of Hot Springs NP is nowhere in comparison with other national parks. It may be the oldest, but the most underwhelming of all the ones I’ve been to from Alaska to the Virgin Islands. That said, if you’ve never been, it’s probaby worth a few hours to walk through if you’re in the area. Because of a big rain that had come through earlier in the week, many of the colors had just faded and many of the trees were already without leaves. On the bright side, the weather was on the cooler side, but very comfortable for hiking and perfect for jacket weather. Each year, it seems to vary, but generally the last week of October to the first week of November is the peek season for central Arkansas. Mount Magazine State Park is a must see! At the top is a nice hotel and lodge that’s frequently booked full during this time of year. The view is spectacular and worth the drive. We stopped for lunch at the top at the lodge restaurant overlooking the trees and land below. We had missed the peak by about a week, but the views were still fantastic. Mount Magazine, view from the top. On the way back to Little Rock, we stopped by Petit Jean State Park. 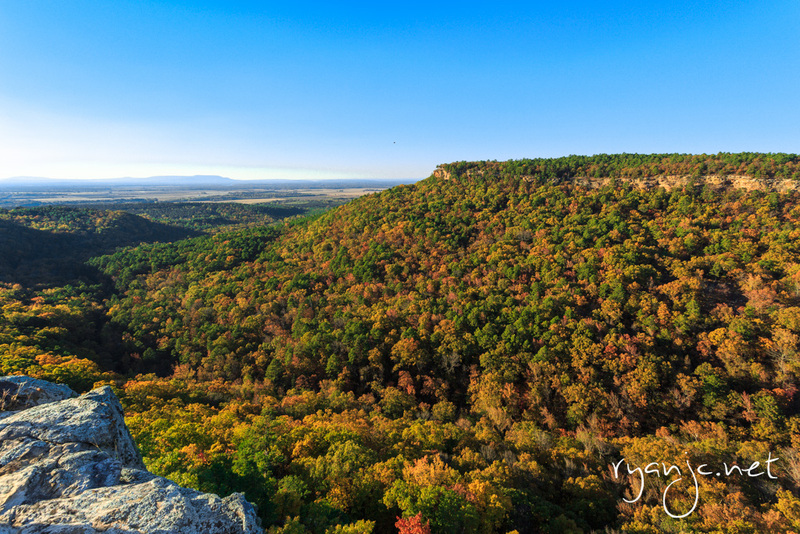 Petit Jean has tons of trees, cliffs, and water. You can’t ask for anything more. The foliage here was phenominal and I wish we had more time to spend there. They have a famous waterfall (Cedar Falls) that you can hike down to. Unfortunately, sunset was closing in quickly, so we decided not to hike in the dark. 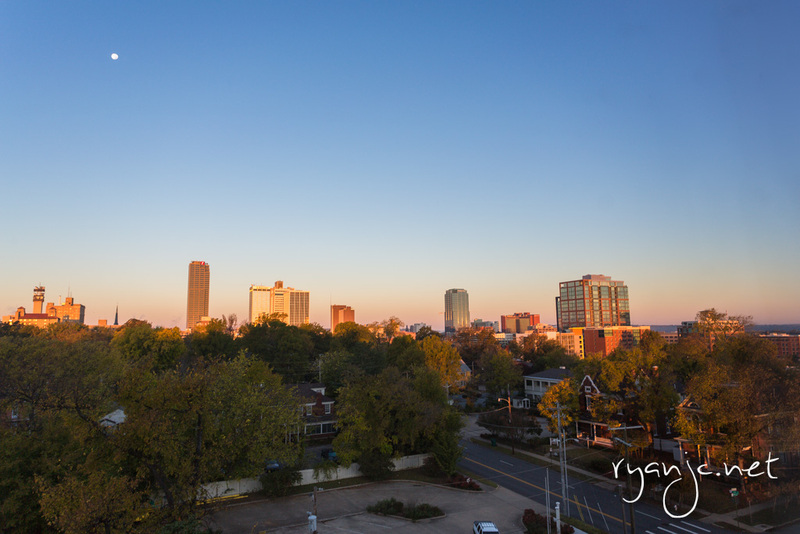 Moon over downtown at sunrise from our hotel. 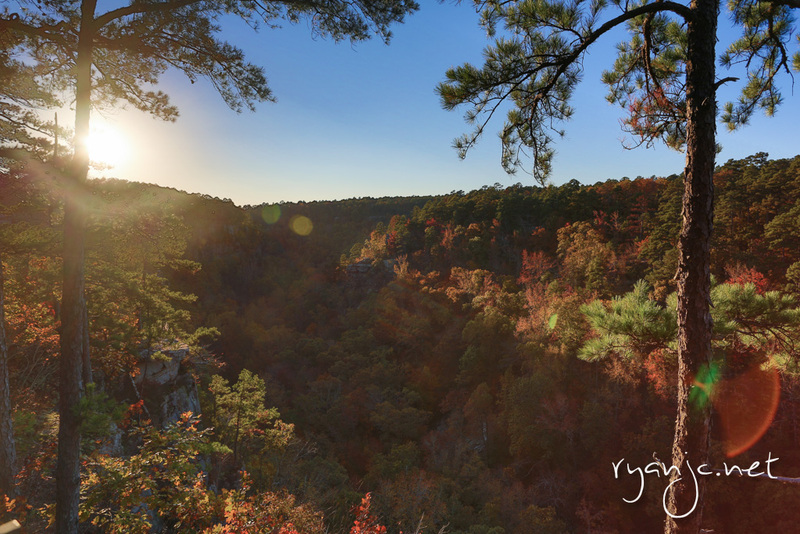 On Sunday, we woke up early and headed out towards Mena, AR, home to the Queen Wilhelmina State Park which spans from Oklahoma to Arkansas. 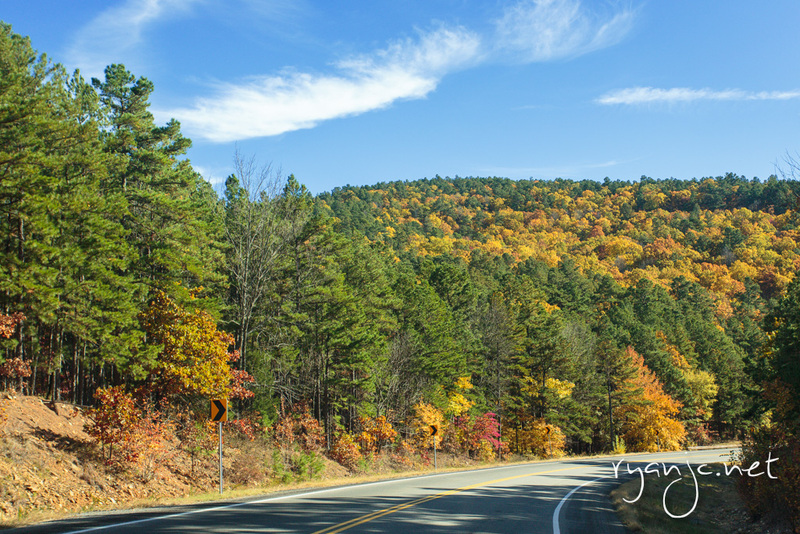 It’s one of the many scenic byways in the nearby area. Last year around the middle of October, we were in Mena in the Ouchita Mountains to catch the leaves, but it was all green. 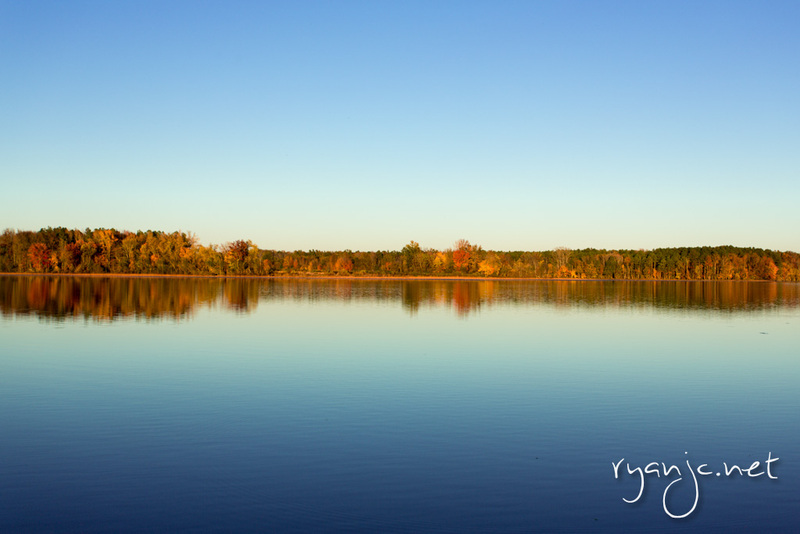 A few weeks or days can make a huge difference when it comes to fall colors. For the most part in the Ouchitas, the color had passed it was mostly a dull brown, but the views from atop the mountains were nice. Crossing back into Oklahoma, the color started to pick up again as we ventured further south back to Dallas. Just before the color peak in southern Oklahoma.